A report estimating the cost of cultivating and manufacturing medicinal cannabis was recently released by Australia’s Office of Drug Control. The report, prepared by Deloitte Access Economics, examined costs associated with three different grow scenarios: broadacre, greenhouse and indoors. In terms of cultivation to meet Australia’s projected demand*, the cost works out to be anywhere between $75 – $2,291 per square metre, depending on the type of cultivation. The share of annualised costs for aspects of cultivation varies wildly depending on the cultivation method chosen, as illustrated below. With regard to exporting dried plant material products (flower and whole plant), broadacre won out again by a large margin. For broadacre, export of raw material was $884 per kg dried flower, and indoor the most expensive at $1,901 per kg. Deloitte points out that while broadacre is cheaper, cultivating under controlled conditions in a greenhouse or indoors may result in greater supply security and potentially a higher quality product. The latter is particularly applicable to cannabis oil, where indoor-grown plants tend to yield higher quantities of sought-after compounds such as cannabidiol (CBD). Deloitte has acknowledged it has needed to make a number of assumptions in preparing the report given the short timeframe required to complete the analysis and the fact a medicinal cannabis industry is yet to be established in Australia. As such, the figures should not be taken as gospel. 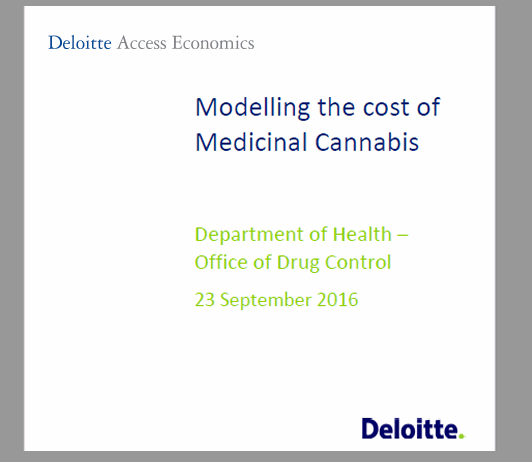 The report, Modelling the cost of Medicinal Cannabis, can be viewed here (PDF). The document was published just a few days before the Office of Drug Control released its medicinal cannabis regulations. * 11 tonnes of dried cannabis flowers for consumption by 30,400 patients at maturity per annum, based on one gram of plant product per day per patient. Deloitte based this on projections detailed in a publication by MGC Pharmaceuticals and the University of Sydney Business School earlier this year.